Starting Thursday, July 21st the Eliot Neighborhood Association will be canvasing portions of southern Eliot for to see if there is interest in forming an area parking permit district. The area we’ll be canvassing will be from NE Hancock to NE Sacramento between N Williams and NE MLK. If interested you can sign a petition to ask the Portland Bureau of Transportation to start the process of forming a parking district. The goal of creating a parking permit district is to make it easier for residents to be able to park in the neighborhood. Residents and businesses in the area and would be able to buy permits allowing them to use on-street parking in the area. If you live in the area and are interested in signing the petition to make help start the process of forming a parking permit district email me at bradmbak@gmail.com to set up time for me to swing by for you to sign. An annual permit costs $60 a year per vehicle to be able to park on-street. If you have a driveway, you (and guests) can park in the driveway for free. We’ll determine the exact details with PBOT, but in other neighborhoods with permits, daily guest parking permits cost $1 per day and are scratch offs that you’ll give to your guests. How long can visitors park for? This is undetermined as of now. We’ll have a meeting with PBOT to discuss the optimal amount of time weighing making it easier for residents to park and for visitors to be able to enjoy the area. How do you get the permit? There’s a form you’ll mail in to PBOT and they’ll send you annual passes and guest passes. Residents and businesses in the area. Is there a maximum number of permits available per household? There is not. A household may buy as many permits as they want. If enough people sign on to the petition, what would happen next? We’ll have a neighborhood meeting with PBOT. Then PBOT will send out voting ballots. For the parking permit district to go into effect, 50% of the ballots have to be returned and the returned ballots have to be at least 60% in favor. Note: signing on to the petition isn’t approving the permit program, but approving a vote. Do I have to have a car to sign the petition? Do I have to buy a permit if I sign the petition? No and no. If you are a resident you are deciding if you’d like to have this policy in effect in the neighborhood. You are not committing to anything. How many street parking spots are there in the parking permit area? We estimate that there about 375 street parking spots in the permit area. Estimate: The permit area is 10,000 linear feet of curb. Assuming that a quarter of the curb length are curb cuts or unparkable, that leaves 7,500 feet of curb space. A parking spot is 20 feet long, so there are 7500/20 = 375 street parking spots in the affected area. Are there upcoming housing developments in the area that may impact parking? Yes. Here are the planned or in progress projects in the area. There are currently 231 addresses in the proposed permit area. That’s roughly 300 units coming online in the area. If a third of the units have a resident that will use street parking in the area, that’s 100 more cars needing parking spots. 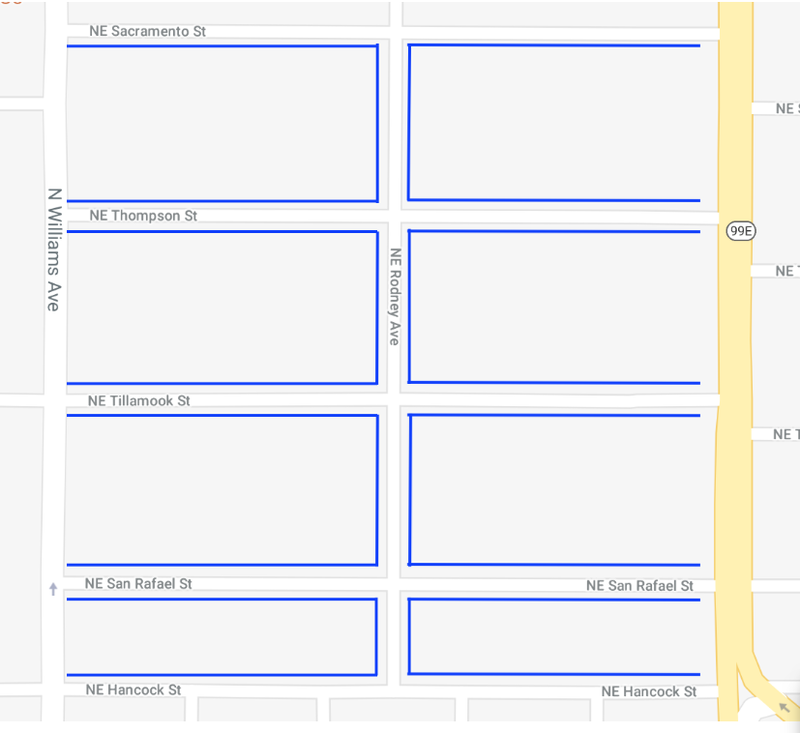 How was this area determined for the area parking permits? Neighbors indicated that parking in this area is difficult. PBOT also found that showed this area had a parking problem. Responses from a newspaper survey showed the highest support here. What if we don’t want a parking permit district in the future? We can go through a similar process in the future to remove or alter the parking district. I heard in NW they had a different parking program that allowed folks to get discount transit passes. Can we get that? Potentially. PBOT is testing out new parking programs and we may be able to use them at some point in the future. They are testing things like limiting the number of permits and raising the permit rate to subsidize low income parking passes and transit passes. I also don’t see how a parking permit situation helps anyways. Will there be a time limit for non-pass holders? If so, will it be enforced? If not, what will be the impact on local businesses? A better solution to be proactive would be for the neighborhood association to insist on more parking (1.5 or 2 spots per unit, no way will it be 1/3 per unit…) for all the high density housing being added. Regardless of paying for a permit, you won’t get a spot if the bad boys don’t start building in garages. Finally, I find it problematic that PBOT will be collecting fees for a problem they and other city agencies have caused with poor planning and loose requirements on developers. I also find it problematic that PBOT is testing limiting permits and raising prices. So basically, we’re assuming it’ll be 60 and hoping that will stay? How can they handle this when they have so many parking and traffic nightmares and they’re creating more every day? If I remember correctly, in our neighborhood, 6% of commutes are by bicycle compared to 3% in the rest of the city. So we’re more bicycle oriented than other parts of the city. The parking passes cost $60 a year. The neighborhood will have the option to raise prices or to limit passes in the future if they so choose, but it isn’t PBOT that does it. We would raise the price or limit if residents wanted that to happen to better manage the demand for parking. It would not be something that would done to be punitive. Also, the $60 per year per vehicle goes to enforcement, so yes, the area parking permit will be enforced. There will be a time limit for guests, likely either 1 or 2 hours. Finally, I get that you would like to see new buildings have parking, but developers are providing what the market desires. Underground parking is very expensive and to make a return on their investment, spots often go for over $100 a month. If there is free street parking, lots of people will just choose to park on the street. By charging a small amount for on-street parking, maybe some people will choose to pay for off-street parking and developers will build more. But if on-street parking is free, lots of the new folks will likely use it and there is less incentive for developers to build parking. Finally, forcing developers to build parking will encourage more people to own cars which will lead to higher costs of living, more congestion in the area, and more pollution. 6% is a great bike commuter rate, and I’m really proud of our neighborhood for that. How many of these 6% of people don’t own a car at all? My point is that while car ownership is usually involved in both, parking and traffic are different issues. I support initiatives to increase bike commuting, public transit, carpooling, and car-sharing, but the overwhelming majority of families would prefer to own at least one car. That means cars parking all day if biking or using public transit, which I think we would all argue is a good thing. With that in mind, I have serious concerns about the idea that the neighborhood would open itself up to the idea that “We would raise the price or limit if residents wanted that to happen to better manage the demand of parking.” By definition, I think this would have to be quite a punitive price to get people to give up the independence of a car on the weekend or other times when needed, whether they be car/public transit/bike commuters during the week. The Sightline articles basically admit that the $60 a year is an opening act that just pays administrative costs. On the other hand, requiring multi-million dollar developers to include parking provides a service to new residents (a guaranteed spot) while not overloading the capacity that pre-existed. Single family houses, even ones without garages or parking areas, generally have enough space in front of themselves to provide for that family unit’s parking needs. High density housing doesn’t, and when adding these to our neighborhood, it squeezes out families that previously have provided their own parking. While developers may save money by NOT creating parking, they’re renting units based on market forces, not passing the savings on to consumers. The savings of not making parking go to their profits. The added demand parking from these residents without raising the supply of parking will increase the problem that residents are experiencing. I don’t think that new high density housing in this area can charge $100 for parking. Like you suggest, no one would pay this with free parking around the corner. This does happen in NW Portland, but only in areas where on-street parking is metered (in other words, residents pay this high fee to avoid a higher one). In other words, requiring these developers to increase supply of parking benefits these new residents (parking provided and guaranteed) and old residents (fewer parking in front of our houses), and developers must keep prices reasonable to recoup as much of their costs as possible. Sightline also argues that cities “give away” on-street parking for free, but I would argue that neighborhood residents and renters already pay for it directly or indirectly with property taxes (though it is a public good that anyone can use). It also argues that in a southern California study, only 25% of families could park a car in their garage because they’re full of junk. My guess is that this study is suburban, and its logic wouldn’t hold with an underground parking lot in high density housing in our neighborhood because you can’t just store your stuff there. Also, if someone wants to be a horder, they can park in their driveway, and they can parallel park to block their own driveway. Is a $60 a year fee going to stop someone from hording? My core question wonders this: how does me paying $60 a year improve the parking situation? This part would only cover the PBOT administrative costs (according to Sightline). My assumption is that this does not mean more enforcement. Administrative costs are generally for mailing out fees, collection of fees, staff to manage and track the program, etc. We need more information where this money would be going. If restaurant patrons, concert patrons, and others can park as visitors for 1-2 hours, they aren’t paying, which I’m OK with because it supports our walkable restaurants and businesses. I would also argue that they won’t be paying if they park over the suggested visitor requirements unless they park a car for multiple days. I’ve never heard of anyone getting a ticket in a non-metered time limit parking area in Portland (happy to hear a story over a beer if anyone has it!). On the other hand, if we make parking passes required with no visitor time, it will hurt these businesses. Seems like requiring parking to be provided by new high density developments is a better way. My street only has issues at the dinner hours/Blazer games, etc. A parking program for residents paying in does not address this aspect. Do we think that some residents will get rid of their cars? The demand will still be high despite the bureaucratic pains unless the cost of parking spots goes up considerably. Particularly with new residents with lack off-street parking in high density housing, the costs will go up to “help demand meet with supply.” The Siteline article “Portland May offer a Parking WIN-WIN-WIN” basically admits that costs have to be raised to actually create more open spaces, supposing $20 a month for one car, $55 a month for two cars, and $60 a month for nonresidents (aka business in the community?). The writer raves about the how the money raised can make the community safer, but that’s coming out of our pockets after we already pay taxes. It’s also driving people with less money to get rid of their cars first, which I think hurts equity. If you raise the fees enough to subsidize, then it’s still unfair to the next unqualifying income group. Last night I drove home on Sacramento Street around 9 PM. Between MLK and Rodney, I counted four on-street parking spots open. Two more were taken up by construction materials for the sewer system coming in. I don’t see the benefits either paying $60 a year for administrative costs or raising the cost a ton to try to drive people out of owning/parking cars. On the other hand, if the influx of high density housing has to provide for some of its own parking, then we won’t have a crisis. Attacking the demand side of things means attacking our own pocket books. Addressing the supply side seems much more effective to me. I am willing to keep examining this issue before making my final decision. I’d like to hear about a residential area where this is currently working well in the city. Did their rates stay at $60? Did residents think there was more parking available? I’d like to see the area and talk to residents in that neighborhood. Regarding the map on the website, is it accurate in depicting only the north side of Hancock and only the south side of Sacramento requiring permits? I know that economics comes with assumptions about human behavior and I am willing to question my assumptions, and appreciate discussing this with my neighbors. Wow. Thanks for the thorough and thoughtful response. You clearly have thought about this a lot. I can’t go into responses for everything right now, but let me offer a book that made me think differently about parking. It’s called “The High Cost of Free Parking” by Donald Shoup and it really informed how I think about parking in cities. It gets deeper into parking policy than I ever thought possible. For the factual questions you asked. $60 goes to implementation and enforcement. If we get enough signatures to move the process forward to a vote, we’ll have a meeting with PBOT. Someone from enforcement will come and we can ask detailed questions like how frequently, is it only on a complaint basis, etc. You’re right that the permit is the northern side of Hancock only and the southern side of Sacramento. Other blocks or other sides of the block can be annexed in pretty easily if they so decide they want to. Finally, if we implement the area parking permit district and we don’t see the return on investment, we can disband the program in the same manner that we started it, so it doesn’t have to be in effect forever. Thanks again and I’m enjoying chatting with you about this. Ugh. Residents who live just outside this proposal should take note. Almost certainly this will shift the parking patterns to another part of the neighborhood. In essence this will move the parking problems to your street. Is the estimate for new cars from new residents needing parking accurate? Only 1/3 of the units (not residents) will need parking? Regardless, those new neighbors may be eligible to get a parking permit or more accurately as many parking permits as they have vehicles. If so, the parking permit program may not solve the parking issues caused by increased density and rapid growth. Here are some things that minimize parking issues and don’t shift the problem to other neighbors: driveways, sufficiently sized parking garages in new developments, encouraging residents to use their driveway/garage, and reducing cars in general. It is also worth questioning how this will impact our beloved businesses – not their employees, but their customers. How does it impact Russell Street BBQ, Toro Bravo, Izakaya Kichinto, Ex Novo, Bunk Bar, Queen of Sheba and others? Finally everyone should consider their own burden. One permit per license plate – no sharing among multiple cars. Get a new car, pay a fee to update the permit. Having a backyard BBQ or a birthday party for your kids – where do your multiple guests park? How about guests that stay a few days? Hello I’d like to sign the petition but unsure as to how. The link above doesn’t allow. Unfortunately, I can’t make the meeting tonight as well. Hi Jason, the petition is a physical document. If you send me an email, I can coordinate a time to swing by and have you sign the petition. My email is bradmbak@gmail.com.